A chess set consists of 32 chess pieces, including 16 pawns, 4 Rooks, 4 Knights, 4 Bishops, 2 Queens and 2 Kings. This time we present queen chess pieces that polish in black and glossy look. 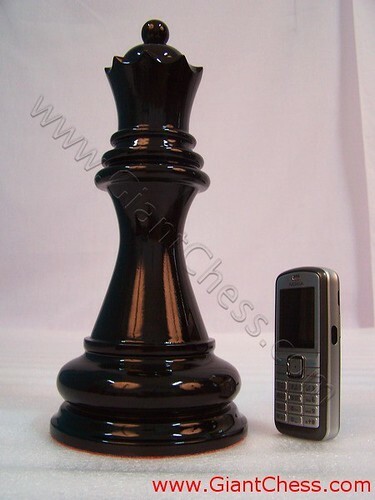 It is one of chess set pieces sized 12 inch, very similar to our 8 inch. The board for this size is 6" x 6" squares. Both chess set and board can also be easily transported to wherever one might wish to play, but may be even more suited to outdoor play - such as in yard, garden, park, or at beach. All that is needed is a balmy day, a flat surface, and a friend with whom to play. Black and glossy chess pieces looks so elegant and luxury. Made of Teak wood and very durable for outdoor also indoor chess game. Beside used as chess game, this chess pieces also suitable for gift. May be you feel confuse about some gift in special event for one of your family, friend, or someone special. Try to give something different than other. Try to give this kind of chess pieces to them. Sure that they feel surprised and never forget.